Our Athens for Foodies tour is a real head-first dive into the Greek gastronomy that tourists often miss on their trips to Greece. There is so much more to the Greek cuisine then moussaka and souvlaki; in-fact, during the tour, you will learn that moussaka is one of Greece’s most recent food inventions! That being said, this tour will not only satisfy your palate and your belly, but you will also leave intellectually satisfied as this is a 4-hour tour of Greek gastronomy history which is very influenced by the historical and cultural progression of the country. Greece’s history is among the longest and most fascinating: there are thousands of years of influence that make up Greek cuisine today. 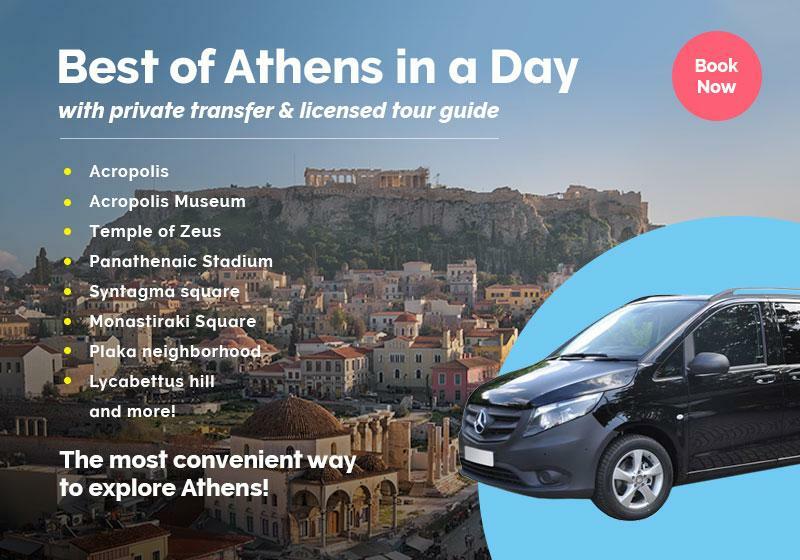 As you begin your tour, you will stand in Syntagma Square, where you will have a 360-degree view of the architecture of modern Greece with the parliament building just behind you. You will start the tour with a typical modern Greek breakfast, the Thessaloniki koulouri, which you will have undoubtedly seen sold everywhere. Did you know that almost all of the koulouri stands found in the center are supplied by the same bakery? Indeed, one of the oldest bakeries located in Plaka produces up to 50,000 pieces a day which is delivered to all of the pop-up stands you find spread out across the center. That is why they all taste the same! As the tour goes on, you will learn about the origins of Greek food from the various historical ages which will make your mind boggle! Herbs and spices are guaranteed to be found in all Greek kitchens: oregano (rigani), bay leaves (danfofila), thyme (thimari) are certain staples that are present in almost all traditional Greek dishes. Spices such as cinnamon (kanela), pepper (piperi) and saffron were brought to Greece from India by the world famous conqueror Alexander the Great, and have been ingrained in Greek cuisine ever since. That being said, there is a special street in Athens that you will visit on this tour which is dedicated just to herbs and spices. Athens most spicy street is alive and kicking every day with lines and lines of people waiting to buy the best quality spices available in the city (you can literally smell the spices before you see them!). 3. Is it Greek coffee or Turkish coffee? One hot and ongoing debate is if the traditional Greek coffee we know made in a briki (a narrow pot) is Greek or Turkish. This traditional beverage is found in all cafes and is made with a fine grind of coffee which is then boiled in a briki and served in a small cup that holds only 90 ml of liquid. On the food tour, you will visit some of the best places to buy these grinds which are produced from huge machines - don’t hesitate to buy some to take home with you! Since Greece was occupied by the Turks for 400 years, naturally, there were spillover effects, and the Greeks adopted some Turkish customs -like coffee- and made them their own. Due to increased animosity between the countries, Greek coffee is the PC term for this beverage! Although this coffee is small, a typical Greek coffee session can last over an hour by the time all the socializing and gossiping is over! You will learn on the tour that there are three main influences of Greek cuisine today: Alexander the Great, Asia Minor and Nikolaos Tselementes. Alexander the Great, one of the world’s greatest military geniuses and most successful conquerors of all time, as previously mentioned, brought a variety of spices from Asia to Greece which has now become staples in the Greek diet. Fast forward 2,000 years and Asia Minor now occupies Greece, bringing along with it distinct dishes such as dolmades, imam, soutzoukakia, and sweets such as baklava. Fast forward another 500 years and, Nikolaos Tselementes, perhaps Greece’s most famous and influential chefs of the early 20th century, unites Greek cuisine with the rest of modern Europe. Tselementes very cleverly brought together all the elements of Greek cuisine at the time and combined it with what the rest of Europe was doing in their kitchens, creating today’s moussaka. The spices of Asia Minor and the vegetables from Greek soil topped with minced meat and the French bechamel sauce, tie perfectly together to make the most famously delicious Greek dish. Cheese pies are one of the most commonly consumed food items in all Greek bakeries. They make for a great breakfast (Greeks usually eat on-the-go) as they combine delicious pastry with a good dose of cheese for protein. That being said, there are many types of cheese pies that can come small or large, round or square, but perhaps the two main variations are in the type of pastry used. Puff pastry and kourou phyllo are the two most commonly found types which vary in texture and taste - but one would argue they are both addictive! On our food tour you will stop at one of the oldest bakeries in the area where you will taste the kourou pastry. This little bakery is simply exquisite as it is completely unchanged from how it was 100 years ago -you will feel you like you have gone back in time. When traveling, it may be hard to find vegetarian options, as meat is almost everywhere in all cuisines. However, Greek cuisine is actually very vegetarian-friendly due to the fact that Greeks fast for religious reasons a good amount out of the year. Thus, there are many animal-free options in the Greek diet that makes this country perfect for vegetarians! Stuffed and baked vegetables, beans, lentils, favaand salads are all dishes that Greeks consume on the regular and are all completely free of animal products. On our food tour, you will get to try some of these delicious meat-free options which are super dense in nutrients and flavor! We have acknowledged the demand for learning more about vegetarian options in Greece and have developed a mouthwatering Vegetarian Food Tour that you must try! You can explore Greek gastronomy with our other food-oriented Athens tours like our Night Food Tour & Wine Tasting, Night Crawlers, or the hand-on Tasting Greece Workshop: all carefully created to satisfy the foodies out there who want a healthy dose of Greek gastronomy!